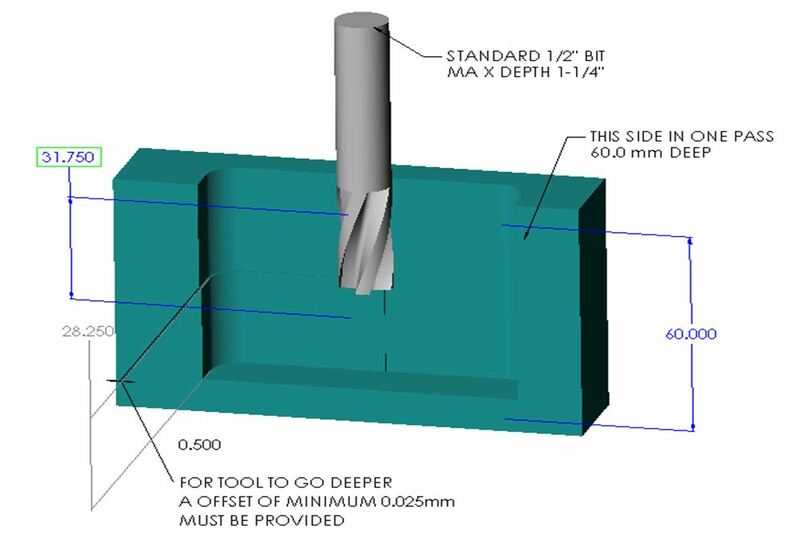 Design parts with corners pocket radius 10% larger than a typical end mill diameter. 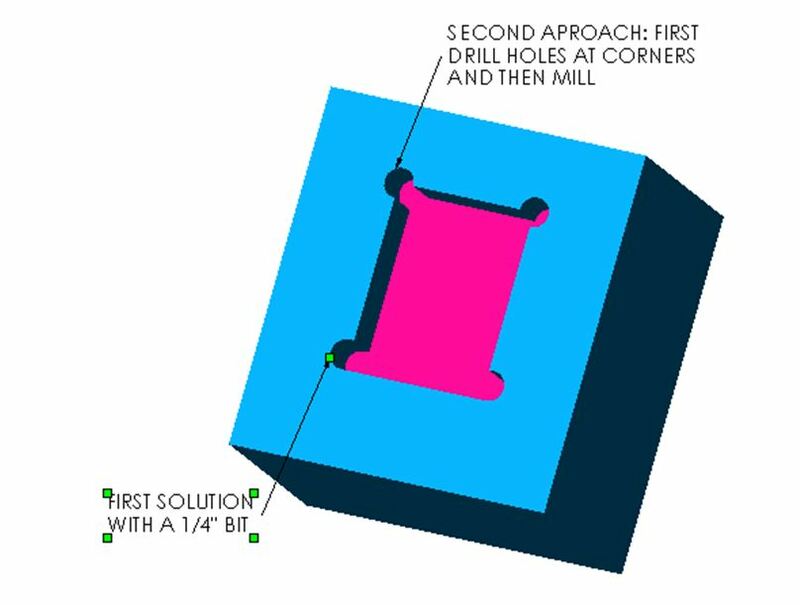 Adding .20 or .30 to corner rad radius larger than end mill size will reduce the surface area coming into contact with the milling tool. If possible, deep milling to a shoulder should be avoided. For 1.2” inch end mill design corner radius 10 % larger. 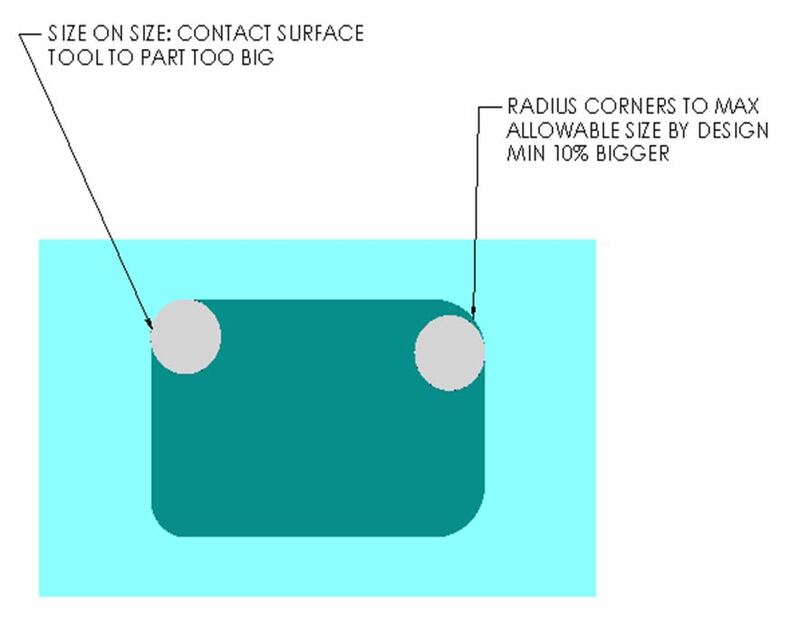 Surface area of end mill in contact with the corner of the part is decreased when the corner diameter is increased. This helps to prevent chatter and maintain good surface finish on the part. This will avoid end mill chatter. End mills will last longer when they are rigid, deeper the pocket wall, it is more likely the CNC Milling end mill will more likely to chatter with deeper pocket walls. If you require mating part has sharp corners, cut away inside corners of the pocket (see image below). Extra long end mills are available, having a cutting length of 4 times the diameter. However, cutting performance is much slower and tooling costs are lot higher. Avoid multiple parts setups for cost effective CNC Milling. Review your part tolerance and do not apply tight tolerances to every feature on drawing. Close tolerances will increase your part cost. Higher quantity of CNC machined parts makes huge difference in cost per part. This will allow to distribute cost of setup and programming to spread out on larger number of parts. Similar parts can machined together can save on reprogramming & fixturing. ﻿Are You Interested to reduce Machining Cost on your parts?